Location: meet at Santa Maria della Luce, via della Luce, 3, Trastevere, Rome. We will walk together to St Peter’s Square. 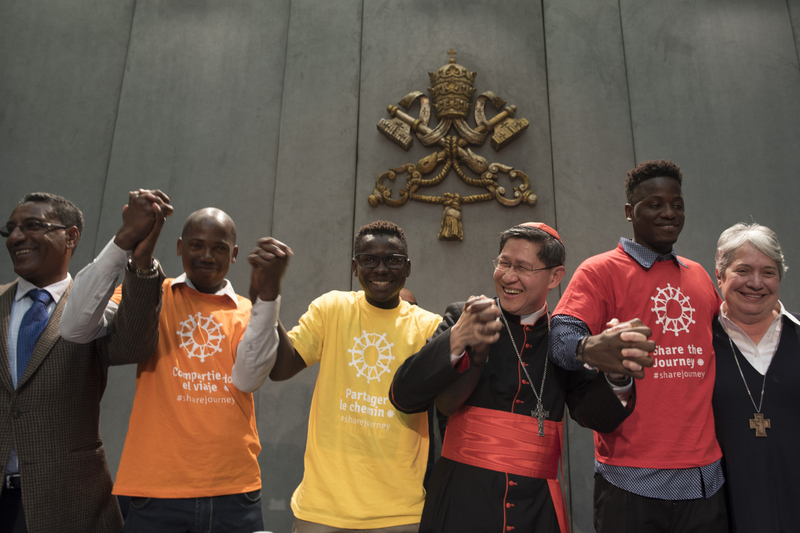 The Share the Journey campaign, which was launched by Pope Francis, aims to bring communities closer together with migrants and refugees by organising spaces and opportunities for the “culture of encounter”. “The big challenge in this time of harsh divisions is to oppose a rhetoric of fear and hate with actions of love, kindness and mercy, such as the ones proposed in our Share the Journey campaign,” said Cardinal Tagle. “If the wars and poverty in the world today make you feel powerless, take back your power by connecting to migrants and refugees who flee other lands, and listen to their stories. By walking together and talking with each other we recognise a sister, a brother, a neighbour and ourselves. “We realise that even though our world seems to be united in fear at the moment, we are also united in the hope of a better life and a peaceful future. A change in our hearts and in our communities starts with the decision to take one simple step with migrants and refugees,” said the Cardinal. The Rome walk is one of many being organised around the world. Caritas organisations in Chile, New Zealand, Canada, the UK and the USA have already started to walk with migrants and refugees. Many others are planning pilgrimages over the next six months. There are national Caritas organisations in over 160 countries worldwide. The global walk is the latest united initiative promoted as part of the two-year campaign. In June 2018 Caritas organisations around the world organised shared meals with migrants and refugees in communities. Organise a walk in your own community and join us in our challenge to walk 1 million kilometres with migrants and refugees. Each step we take around the world is a step towards building stronger communities and opening our minds and hearts towards a common future. Learn more about the global walk and download our walk guide to get your journey started.